Advisers and friends say the president feels emboldened, even invincible, as he talks and tweets. And despite the now-routine condemnations, the president is acting emboldened, as if he were impervious to the uproar he causes. 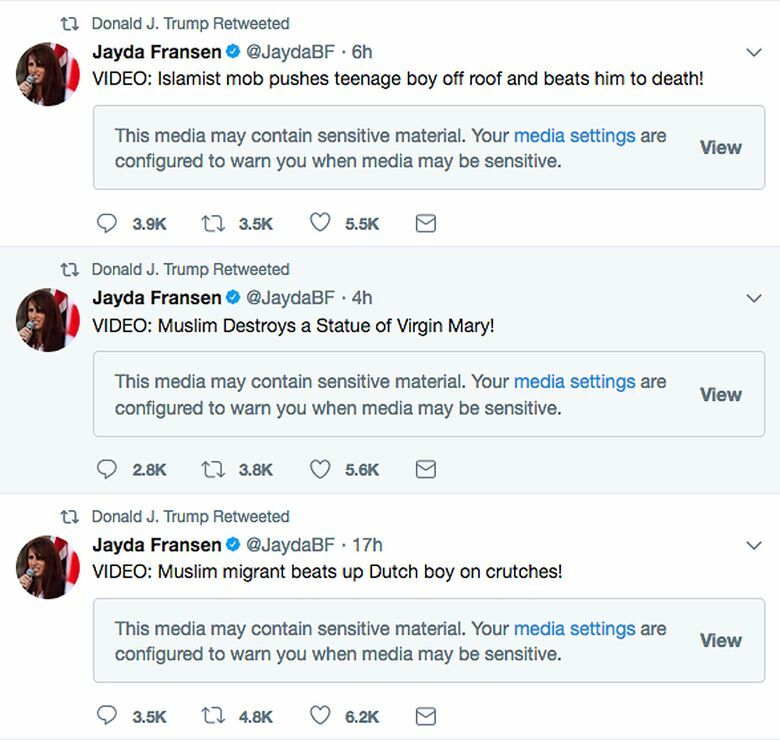 On Wednesday, Trump took to Twitter before sunrise to share three unverified videos with his 43.6 million followers that seemed designed to stoke anti-Muslim sentiments. He then relished in the firing of Matt Lauer from NBC’s “Today” show for sexual misconduct, and he fanned unsubstantiated rumors about three other NBC and MSNBC executives and personalities. Two days earlier, Trump used a ceremony honoring the World War II Navajo code talkers to deride Sen. Elizabeth Warren, D-Mass., by using his nickname for her, “Pocahontas.” Native American leaders and other Americans have strongly objected to the characterization as a racial slur. Trump traveled Wednesday to Missouri, where he pitched the tax plan. He explained that he did not mind that the bill might close loopholes for the wealthy like himself. The president was talking about taxes but might as well have been describing his overall mindset. Trump’s anti-Islam tweets on Wednesday — he retweeted videos first posted by a leader of the far-right Britain First party, an extremist group that targets mosques and Muslims — earned him a sharp rebuke from the British prime minister’s office. They also caught his West Wing team off guard. One aide said staffers were unsure exactly how to respond to — let alone defend — his tweets, while another noted that the tweets were unexpected but not necessarily out of character. “Whether it’s a real video, the threat is real, and that is what the president is talking about,” Sanders said. Jason Miller, a former Trump campaign adviser, said the media were overreacting to Trump’s sharing of anti-Muslim videos. “A very small number of people, primarily in New York and Washington, are complaining about the origin of the tweets, and most of the rest of the country is talking about the need for stricter border security and the threat of radical Islamic terrorism,” Miller said. Still, by sharing the videos, Trump created problems for himself. He undermined the administration’s legal strategy in defending the controversial travel ban by offering evidence of anti-Muslim bias. Federal judges have blocked various versions of the ban because it is akin to an unconstitutional ban on Muslims, which Trump had called for during the campaign. Trump’s advisers and friends said the president feels emboldened, even invincible, to communicate as he chooses — especially on cultural issues, believing his stances work for him politically by galvanizing his base. Having long trafficked in conspiracy theories — his political rise was fueled by his role as one of the nation’s leading champions of the false claim that President Barack Obama was not born in the United States — Trump continues, as president, to promote falsehoods and reject facts. Trump has recently told friends that he believes special counsel Robert Mueller’s Russia investigation will be winding down by the end of the year, and that he will be exonerated, even though many experts and others close to the wide-ranging probe say that view is overly optimistic. Trump has watched as other high-profile men’s careers have crumbled under the weight of public accusations of sexual misconduct. Yet Trump has faced no disciplinary repercussions, even after bragging on a 2005 tape about having sexually assaulted women. “Grab ’em by the p—-. You can do anything,” Trump told “Access Hollywood” host Billy Bush, who lost his job over the incident. During the 2016 campaign, more than 12 women publicly came forward with claims that Trump had sexually harassed or assaulted them. Yet Trump categorically denied the women’s accounts and won the election. Trump occasionally has even speculated, in private conversations with advisers and friends over the past year, that the voice in the “Access Hollywood” tape may not be him or the tape may have been doctored. Trump feels especially liberated when he is at Mar-a-Lago, his lush seaside resort in Palm Beach, Florida, where he spent the Thanksgiving holiday, according to his friends. There, Trump enjoys a less structured and disciplined environment than at the White House, where chief of staff John Kelly attempts to tightly control who the president sees and what information he receives. In Palm Beach, friends and club members can approach Trump at will — over meals in the Mar-a-Lago dining room or on the greens and club houses at his nearby golf courses — and try to plant ideas in the president’s head, which he sometimes repeats or acts upon. Two outside advisers to Trump suspected it was no coincidence that Trump returned to Washington on Sunday night and soon thereafter struck a pugnacious tone in his public comments. “Mar-a-Lago stirs him up,” said one of the advisers, who spoke on the condition of anonymity to be candid.